Wim Wenders, director premiered, this film at this year’s Berlin International Film Festival. The film is about Philippine Bausch, (affectionately known as Pina). She is considered one of the most influential figures in European contemporary dance. I decided to see the film first and do my research afterwards, so that I was going in with an open mind. After the film, I wanted to find out more and seek answers to some questions I had after seeing the film. What were the dance pieces in the documentary? This is what I found out. The dance pieces in Pina are expressionist dance; a form of dance known as Tanztheater originating from Weimar Germany in 1927 and Vienna in 1920’s. What’s the story behind Pina’s involvement? As for the dance pieces in this film, they were chosen by Pina herself before she died. Pina was going to perform them herself and filming had been scheduled for 2009. However, five weeks after being diagnosed with cancer, and one week before filming, Pina died very unexpectedly. The filming of Pina’s dance sequences was to commence on 30 June 2009. She was aged 68 when she died. The original film project came to a halt when Pina suddenly died. The finished film documentary resulted in part from the dancers’ requests, after a period of mourning. They felt this was what Pina would have wanted, with Wim Wenders as director. What’s the relationship between Wim Wenders and Pina? After seeing Café Muller , Wenders decided that a film on Pina Bausch that would focus on her way of looking at things and on her capacity to make body movements express human relations in their most profound and precise form was essential. However he would have to wait years for technology to catch up with his ideas for the film. Wenders has kept to Pina’s original film ideas and despite her absence in performing the dance pieces; she is still part of the film, through historical interviews and films of her earlier career in dancing. True to her original ideas, the film is not about choreography, nor is it a biography. This film is not about her life; it concerns her creative pieces of dance. In her lifetime Pina avoided giving any interpretation or explanation about her dance pieces. She requested there be no language, just movement and expressionist dance, in this film production. Wenders seems to have understood her quite well and this is what has made this film so special, a great honour to Pina’s memory and a celebration of her life! I can’t help but to believe that Pina would have been the first person to stand up and clap. I believe that this film documentary will go on to win top awards, for director, cinematography and stereography. This film in 3D has captured the natural movements fluently, precision of movement and dance, in a limited space, looking natural. Separate to this film, I watched an interview, where Wenders describes his reasons for filming in 3D; “to enter space of dancers, experience and presence of their dances and emotions; to experience aura of each dancer”. He also describes complexities of filming in 3D; “it is a mathematical process, not simple”. Those interested in the 3D process can find an article by Producer Erwin M. Schmidt on the topic here. Why were some scenes performed outdoors? The director, cinematographer and stereographer have all captured space and body movements with great precision, the movements and expression involving two themes of dance. The first theme being dance pieces performed of various sets. The second theme, dance pieces performed in public places; industrial landscapes, the sweeping countryside, the Bergisches land, the Wuppertal Suspension Line. I particularly liked how the film went back and forth between the two themes, and between the sets and public places. The dance pieces without language were interesting in the absence of a story line. one of her best-known dance-theatre works the melancholic Café Müller (1978), where the dancers stumble around the stage crashing into tables and chairs. the thrilling Rite of Spring (1975), where the stage is completely covered with soil. Masurca Fogo, which sees half of the stage taken up by a giant, rocky hill, with water splashing down. There are also several scenes of dance and dialogue about male-female interaction, a common theme which runs throughout her work. The film describes how Pina’s dance pieces consist of short units of dialogue and action, surreal in nature. Repetition is common in her dance pieces, as the large productions often involve elaborate sets and dance set to eclectic music. Neither does the film need language, Pina was right: “only the expression of movement and dance was needed, without language”. The only dialogue in this film is from comments taken from interviews with the cast of dancers, who had worked with Pina. 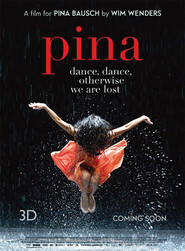 I thoroughly enjoyed this film; it is a great way to celebrate Pina’s life. It has set the benchmark in modern film directing. A great film documentary, it honours two geniuses! Wim and Pina met in Venice in the mid-1980s; Pina the dancer, choreographer and Wim Wenders Director. I highly recommend this for all to go and see. Let me end with a quote from Wenders: “Only through Pina’s Tanztheater have I learned to value movements, gestures, attitudes, behaviour, body language, and through her work learned to respect them”.